Bean (also known as Bean: The Ultimate Disaster Movie or Bean: The Movie) is a 1997 comedy film based on the British television series Mr. Bean. Directed by Mel Smith and written by Robin Driscoll and Richard Curtis (both Mr. Bean veterans), the film stars Rowan Atkinson in the title role, Peter MacNicol, Pamela Reed, Harris Yulin and Burt Reynolds. It is a British-American venture produced by Working Title Films, Tiger Aspect Films, and distributed by PolyGram Filmed Entertainment and Gramercy Pictures. 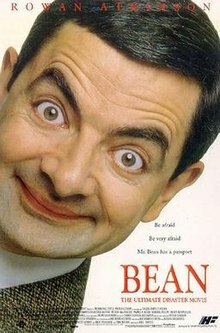 Bean was released in the United Kingdom on August 2, 1997 and in the United States on November 7, 1997 to mixed reviews from critics but was a box office success, grossing $250 million worldwide against an $18 million budget. A stand-alone sequel titled Mr. Bean's Holiday was released in 2007. Mr. Bean is a well-meaning yet hopelessly clumsy and destructive security guard working at the "Royal National Gallery" in London. When the gallery's board of directors, who despise Bean for sleeping on the job, fail to fire him due to the chairman threatening repercussions, the board immediately decides on a different course of action and has him represent them during the transfer of the portrait Whistler's Mother to the Grierson Art Gallery in Los Angeles, following its purchase by philanthropist General Newton for $50 million. The curator of the Grierson, David Langley, who is impressed with the false profile of "Dr. Bean", agrees to accommodate him at his house for two months, much to the chagrin of his wife Alison, his son Kevin and daughter Jennifer. After Bean encounters mishaps with the airport police and accidentally breaks a family heirloom, Alison leaves for her mother's house along with Kevin and Jennifer. David begins to question Bean's intelligence after he suggests they head to an amusement park where he rigs the control panel of a simulator ride to make it more exciting for him, resulting in him getting him arrested a second time, and he later messes up a dinner with the gallery's owner George Grierson. When David questions Bean, he finds out that Bean is not a doctor after all, after having knew absolutely nothing about art, and things get worse when Bean accidentally defaces the painting shortly after it arrives. Fearing that he will lose his job and possibly face criminal charges for the damage, David becomes despondent and gets drunk, even though his family returns out of pity. To save David's career and not get arrested again, Bean sneaks back into the gallery, distracts the guard by lacing his cup of coffee with laxatives and replaces the defaced painting with a poster. The plan works on the next day, fooling everyone including Newton. Bean nearly panics when he has to make a speech, but gives an improvised, sentimental and deep monologue about the painting that wins the crowd's praise and approval. Bean is then approached by Lieutenant Brutus (with whom he crossed paths on two earlier incidents), making David worried that he knows the truth about the priceless painting's mishap, only to learn from him that Jennifer was rushed to a hospital after being involved in a motorcycle accident along with her boyfriend. Rushing to the hospital, David goes to be with his wife, leaving Bean to wander around the hospital's reception area and be mistaken for a doctor after picking up a stethoscope that had been accidentally dropped onto the floor. Forced into a surgery room and dressed in surgical scrubs, Bean comes across Brutus on the operating table (who have been shot while dealing with a mugging), whereupon he manages to remove the bullet from his body via an unorthodox procedure which saves his life. David then begs Bean for his help in reviving Jennifer from a coma, to which he succeeds after an accident with a defibrillator sends him flying and landing on top of her. Grateful for having their daughter back, David and Alison are surprised when Bean reveals his true identity. At Bean's suggestion, they repay him by allowing him to stay with them for another week. After spending some quality time with David's family, Bean heads back to the airport and thanks David for the time he spent with them before returning home to London. At his flat, Bean admires his bedroom which is now decorated with photos of himself and the Langleys as well as the original Whistler's Mother painting he ruined and smuggled back with him, before going to bed. David suggests Bean stuffs the turkey while he distracts the Griersons during the dinner party. While stuffing Bean loses his watch and puts his head inside but gets stuck (a gag reused from Merry Christmas Mr. Bean) and has the turkey pulled off by David. When searching the refrigerator Bean finds two frankfurters but David thinks the Griersons are expecting something slightly more formal. Bean then finds the onion, later offered as the appetizer, then the turkey. Unable to find something else David asks Bean if he ever cooked a turkey before to which he replies 'Ah yes'. David points out that it would take about five hours to which Bean replies 'Not necessarily'. As they shove the turkey into the microwave oven a role is reversed in which Bean, instead of David, suggests running it for 20 minutes. In this scene Bean's hair is clean having not literally 'had the turkey on'. According to Rowan Atkinson, in the documentary Bean Scenes Unseen, the reason for the difference is the very different reactions from the American and European audiences in the test screenings. The film's score was composed and conducted by Howard Goodall, who had also written the music for the television series although the original Mr. Bean theme was not used. Other non-original songs were also featured such as The Beatles' "Yesterday" (sung by Wet Wet Wet). The soundtrack Bean: The Album contains the OMC cover of "I Love L.A." despite the original by Randy Newman being the version used in the film. The album also features a song not used in the film, a cover of the Alice Cooper song "Elected" performed by Iron Maiden lead singer Bruce Dickinson which features sound dubs of Mr. Bean making campaign promises. This had previously been used for Comic Relief in 1992. Boyzone also released a single from the film, titled "Picture of You". Bean initially received a limited release on October 17, 1997 in 242 theaters and grossed $2,255,233 with a $9,319 per-theater average and ranking #10 at the box office. Upon its wide release on November 7, 1997, the film earned $12,733,827 in its opening weekend while playing in 1,948 theaters, with a $6,536 per-theater average and ranking #2. By the end its theatrical run, the film grossed $45,319,423 domestically and $205,893,247 overseas for a worldwide total of $251,212,670. Against an $18 million budget, the film has become a financial success. On Rotten Tomatoes, the film holds an approval rating of 41% based on 32 reviews with an average rating of 5.3/10. The site's critical consensus reads: "Bean boasts a terrifically talented physical comedian in the title role, but his constant mugging and silly slapstick quickly wear thin." On Metacritic the film holds a score of 52 out of 100 based on 20 critics, indicating "mixed or average reviews". ^ a b c "Bean". Box Office Mojo. Retrieved 14 January 2015. ^ a b "Bean Scenes Unseen (reference starts 8:35 into the video)". You Tube. Retrieved 24 January 2018. ^ "Bean (7/12) Movie CLIP - Stuffing the Turkey (1997) HD". You Tube. Retrieved 29 January 2018. ^ "Bean. Turkey". You Tube. Retrieved 24 January 2018. ^ "Bean (1997)". Rotten Tomatoes. Fandango. Retrieved 30 June 2018. ^ "Bean Reviews". Metacritic. CBS Interactive. Retrieved 14 January 2015.